Akwasi Asante was raised at HFC Haarlem before moving abroad to the youth academy of Birmingham City. He played several matches at the Reserves and even played in a Europa League match before making loan periods Northampton Town and Shrewsbury Town (end of 2012-13 season). He was under contract in Birmingham until June 2014. In December 2014, Asante moved to Kidderminster Harriers to join the club for the second half of the 2014-15 season. In the summer of 2015 Asante moved on a transfer-free deal to Solihull Moors FC, competing in Conference North. Asante signed a two-year contract. At the end of the season Solihull promoted as champions to the National League, the fifth level in England, with Asante as the leading league scorer for Solihull with 17 goals. 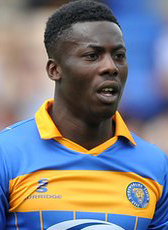 In January 2017, top scorer Asante was signed by Grimsby Town on a 1,5 year deal. Grimsby Town is competing a level higher in the League Two. However in October, he returned to his former Conference club on loan until January 2018. In mid-season 2017-18 he moved to amateur-level at the National League club Tamworth FC.